I concur with others - bureacracy should have been listed as cause of death. Too many politicians are worried about their careers instead of public safety so they tie the hands of the men and women who are there to protect us. EVERY police officer should have the right to carry on and off duty, after all you are a cop 24/7, thank you and everyone else whose job it is to keep us safe. Mark made the ultimate sacrifice and will be forever remembered by both the officers of the VA Police, and all of the veterans of war. RIP brother. On Monday January 31, 2011 will mark the 25 year that Off.Decker(Vice President FOP OHIO Decker/Wilcox Memorial Lodge #175) and Off. 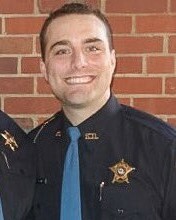 Wilcox (both veterans)were on duty and was shot and Killed by a veteran seeking treatment at the Brecksville, Ohio Dept. of Veterans Affairs Medical Ctr. These Brave and Dedicated Police Officers paid the ultimate price while Protecting and Serving Veterans, Employees and Visitors who enter the Medical Ctr. Condolences to their families. May they Rest in Peace,God bless them. On today, the 24th anniversary of your death I would just like to say thank you to you and your partner for your service and sacrifice for our Country. And to your family and loved ones, I wish to extend my deepest sympathy. 24 years, how is this possible that so much time has gone by ? I was a friend of Leo & a dear friend of my Mark. I was a VA employee who was working the night my friends were murdered in cold blood. I miss my dear Mark so much. PS... that photo is a copy of the original that I took about a moth before the shootings. Mark didn't like to have his picture taken but I got him at a silly moment during shift change. Hero's are never forgotten! Continue to rest in peace brother. Officer Decker, thank you for your service and dedication. You have not been forgotten. Rest in peace. oficers Wilcox and Decker will always be remembered. Officer Decker, today marks the 21st anniversary of your murder. You gave your life in service to the people of the United States and most especially to our beloved Veterans. I wonder if, had you been armed that day, you might have survived. We’ll never know for sure, but your sacrifice helped to wake up the bureaucrats to the need for EVERY POLICE OFFICER to be armed. It’s still a long road with a lot of administrators living in a fantasy world, but thankfully, the VA Police are now properly equipped. Thank you, not for your sacrifice, but for your service to others. God Bless and may you continue to Rest in Peace, Brother. Rest in peace sir. You will never be forgotten. You and your partner were killed by bureacracy, in 2000, my uncle tried to get me to apply as a va police officer in Asheville, North Carolina. I did not apply because they at the time were not allowed to carry firearms, that however changed in 2002, and not a moment too soon, because just this year a man walked in and shot himself in the head. Also in 2000 the va police in Salisbury, North Carolina shot a man who had shot a doctor in the heart (miraculosly the doctor survived). They had just been issued their weapons two months earlier. I hope all the bureacrats read this and wake up. May Officer Decker rest in peace. Rest in Peace Brother...you served your country well.